We recently changed the package from Founders Oak to Founders Blend—there was NO change to the wine. Research showed “oak” tended to be a polarizing word, even though most people enjoy the benefits of oak. Hope this helps and please reach out if you have any additional questions. In part two of this two part post about boxed wines which I highly recommend for camping trips like Burning Man (or just to have around because they last so long and have a much smaller carbon footprint!) I review Carlo Rossi Founder’s Oak merlot and cab, chardonnays from Vella, Turning Leaf and Pepperwood Grove’s Big Green Box, as well as Pepperwood’s pinot grigio, cab, and old vine zin. If my grandpa was around today, he’d be keeping Carlo Rossi boxed wine in his cellar. How do I know this? Because there are still gallon jugs of Carlo Rossi in the cellar–and my grandfather died in 1997! I think my grandmother would like the golden delicious apple sweetness of the Carlo Rossi chardonnay and my grandfather would enjoy either the soft round fruity (cherry and plum) merlot or the more oaky and vegetal (bell pepper) qualities of the cabernet. The color of both are similar but there’s no confusing the two if you give them a sniff! These are simple wines that will please most people and when you’re camping, sometimes you want to just keep it simple. The chardonnay would be good with appetizers (I liked it best with sea salt pita chips) and the reds work great with BBQ–tritip, ribs, you name it. These are all 5 liter boxes which is almost 7 bottles of wine! I also sampled two more boxed chardonnay–Vella and Turning Leaf. Out of all these boxed wines, I expected the most out of Turning Leaf and yes, it seems like the same wine that’s in the bottle is in the bag! So if you like Turning Leaf in the bottle, for camping, parties, Burning Man or just to have a wine around that will keep for a month or more, try Turning Leaf in a bag. It’s got that same oaky California chardonnay taste and mouthfeel. The Vella chardonnay is a favorite of my sister-in-law–it has nice fruit but it’s golden delicious sweet not as sweet as the Carlo Rossi and it has a little more body and heft to it and some tropical fruit but it’s still lighter than the Turning Leaf. Finally, in the chardonnay department, I liked the Pepperwood Grove Big Green Box. I mean I really liked it. Like Turning Leaf, this is the same wine that you find in the bottle in your grocery store but in a box which means you save green (money) big time AND you go green big time (have a smaller carbon footprint.) I tried it with a lot of different meals and it worked with chicken, fish, appetizers, and more. It’s very easy to enjoy! Out of all the Pepperwood Grove boxed wines, my husband really liked the Pinot Grigio. When I’d open a bottle of something else to sample and offer to pour him a glass, he’d tell me he was just fine with that pinot grigio. This is high praise for a man who usually has a beer or two in the evenings! So if you’re looking for a wine that your typical beer drinker in your camp might enjoy, try the Big Green Box Pinot Grigio. I sampled two reds from Pepperwood Grove also: Old Vine Zin and Cabernet. Read more about how much we loved the Old Vine Zin here. The cabernet is good–balanced and with lots of cherry fruit but honestly, I love zin and I think the zin is an excellent value. 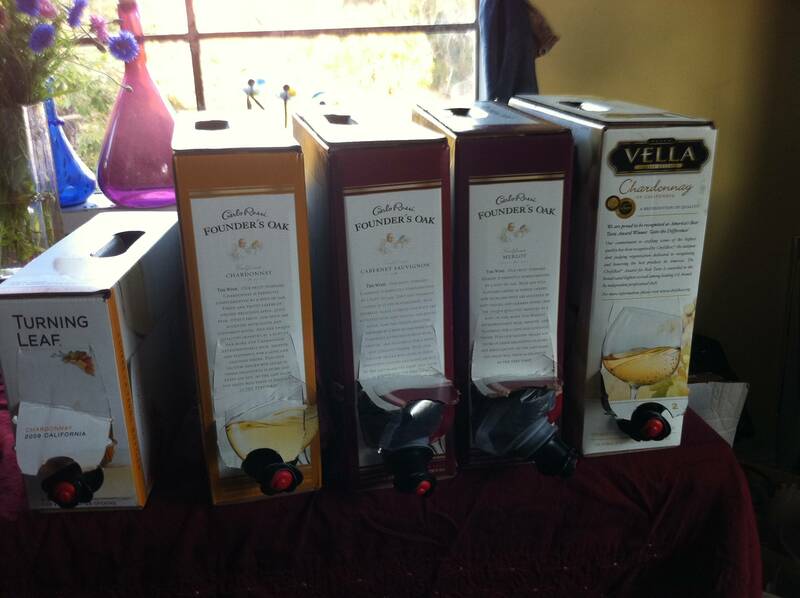 The Pepperwood Grove wines retail at about $20 a 3 liter box containing four bottles of wine. Thanks for the samples, ya’ll! I’ll have all but the Pepperwood Grove out on the playa for you to taste! To find out where, stop by Playa Info –we might be there–or they’ll have info about where we are tasting! I had no clue boxed wine had such selections! Thanks for opening me up to a new world of wine! I am a fan of boxed wines because I have found merlots and cabs that agree with my palate. I spotted Founder’s Oak Merlot in the store several days ago, so I bought a box. Let me tell you… this wine has absolutely no character at all. There is no hint of oak, no hint of berries, and no hint of anything. It’s like Kool-Aid. I will not buy it again. Which boxed wines are your favorites, Rodger? And are they more expensive than the Carlo Rossi? Personally, I liked the Pepperwood Grove Cab quite well. I also think the Big House boxed wines are wonderful–but haven’t posted a review yet. Have you tried that cab? Have you tried bring a box wine onto a cruise ship before? No, I haven’t. It’s worth giving it a try! Let me know how it goes! Founder’s Oak Cabernet was one of our favorites. It was nicely oaked. At least the box of Founder’s Blend Cabernet we tried was not of the same class – in fact, it was quite insipid. There is something different with the boxed Cabernet/Carlo Rossi. I have been buying this for several years now. The box would last 3-4 weeks. About 6 months ago, I noticed the change in dispenser but the biggest change is that the box now lasts only two weeks. No, our wine consumption has not increased by almost half. The box itself seems slightly smaller/thinner? Although the box still states the same volume, something just is not quite adding up. I even contacted the company and was assured that the volume has not changed. Has anyone else experienced this? I can only imagine there’s an elf in your house who is sipping your wine when you’re not looking! (or maybe a teenager?) or are you cooking with it more? that is very odd! at least you were able to get the box to dispense the wine!!! I just bought my 2nd box, thinking something was wrong with the 1st. Not so! Can’t open this box either. Finally had to cut it open with a knife and pour the ingredients into a large pitcher! Looked for a demonstration of how to properly open and dispense the wine, but found none. I was hoping Carlos Rossi had something on You Tube so that I could figure this out. Not so either!